Changed the date parameters to align with Microsoft’s Remove-CalendarEvents cmdlet. StartDate is now QueryStartDate and EndDate is now QueryWindowInDays. The default time frame is still one year from the query start date, but is now specified as an integer of days instead of a specific date. Added a preview mode via the PreviewOnly switch parameter (also to align with Microsoft). Using the parameter will list which meetings (by subject and start date, first occurrence start date if a recurring meeting) would be affected. To provide enough detail, it will indicate if it is a standalone meeting or series and whether the meeting is being canceled (because the mailbox is the organizer) or declined (because the mailbox is an attendee). If you use the EndOrganizedRecurringMeetings parameter, it will also use wording to show that a meeting series’ end date would be updated instead of canceled. Added detection of modified occurrences that will be lost if a recurring series’ end date is changed. Because exceptions to a meeting (only modifications, not deletions) are removed when a series’ end date is changed, the script checks for modified occurrences that occurred in the past of the query start date and prompts you to confirm that you want to update that meeting. Added a switch parameter named SuppressLostExceptionPrompt. Use this if you want to prevent the confirmation prompt about lost modified occurrences and have it change the end date anyway. This parameter only has an effect if also used with EndOrganizedRecurringMeetings. Although added only while I was testing, but decided to leave in, are some extra details written to the screen if you use the Verbose parameter. One of the long-running woes of the Exchange admin is that you can’t transfer “ownership” of a meeting to someone else when the owner leaves the company. While you still can’t do that, Microsoft recently announced the Remove-CalendarEvents cmdlet for mailboxes in Exchange Online. Its intention is to allow the administrator to cancel all future meetings for a terminated employee so that someone else can create new meetings in their place. Because it works only for cloud mailboxes, I wrote a script to do the same thing for on-premises mailboxes (though it will also work for cloud mailboxes). It uses EWS to get all future meetings for a mailbox and cancel them. The default settings are to cancel all meetings that occur in the next year where the mailbox is the organizer. You can also choose to have it cancel (decline) meetings where the mailbox is an attendee, and you can specify text that should be added to the cancellation or decline message. Additionally, if you don’t want to wholly cancel recurring meetings because the history of all those occurrences will be lost for the attendees, you can instead have organized recurring meetings end so that only future occurrences are canceled, but historical occurrences remain. Because of the way calendar items are stored, you can get an item and then see when it occurs, if it is recurring, etc., but if it is a recurring meeting you only see the first occurrence. To work with occurrences, you use a calendar view (time frame) and let Exchange worry about whether an occurrence of a recurring item should be included in the window. But you can have multiple occurrences of the same meeting in the time frame, and you want to delete the series, not an occurrence. In a calendar view, you can see if a meeting is an occurrence and, if so, get the corresponding master for that series. Once the series is canceled (or ended, if you choose that option), there still can be more occurrences of that canceled series in the search results. If you try and get the recurring master for an occurrence whose master has already been canceled, you’ll get an error. So, these occurrences can be skipped, but you have to know which ones can be skipped. To solve that, I store the recurring meeting’s global object ID (which is the same for a recurring master and all of its occurrences because it is really just one meeting as stored in the calendar) in an array. For every meeting in the search results that is an occurrence, I check if the global object ID is in the array. If so, I skip it because its master has already been deleted. If not, I add the global object ID to the array, then cancel the meeting. The script has comment-based help so you know what all the parameters are for, and there are inline comments so you can see what is being done throughout. While you can use current credentials or specify one, if you want it to prompt if you don’t specify credentials and don’t want to use default credentials, you can comment and uncomment the the necessary lines at 81-84. Likewise for the EWS URL, it is hard-coded to EXO, which you can change, but if you want to use autodiscover, you can comment and uncomment the necessary lines at 91-93. Download the script via the link below, but you can see the code and copy it below, too. within a given timeframe. The default is one year from run time. Start date of the timeframe to look for meetings to cancel. Default is now. Number of days after the start date to look for meetings to cancel. Default is 365 days. Switch to end organized recurring meetings instead of canceling them. past meeting occurrences on attendee calendars. Cancel-MailboxMeetings.ps1 janedoe@company.com "6/1/17" "8/1/17" -IncludeAttendeeMeetings -CancellationText "Jane is no longer here." Write-Verbose "EndOrganizedRecurringMeetings is true and first occurrence is in past"
Write-Verbose "Meeting series has modified occurrences"
Write-Verbose "Meeting series has modified occurrence in the past"
Write-Output "Series whose end date would be updated: `"$($meeting.Subject)`" on $($meeting.Start.ToShortDateString())"
Write-Output "Series end date updated: $($meeting.Subject)"
Write-Output "$type that would be canceled: `"$($meeting.Subject)`" on $($meeting.Start.ToShortDateString())"
Write-Output "$type that would be declined: `"$($meeting.Subject)`" on $($meeting.Start.ToShortDateString())"
Write-Verbose -Message "Next loop will start at $StartDate." Write-Verbose -Message "Number of appointment items: $($appointments.Count)"
Write-Verbose -Message "Number of meeting items (with duplicates): $($allMeetings.Count)"
Write-Verbose -Message "Number of meeting items (duplicates removed): $($meetings.Count)"
Write-Output "Processing $($meetings.Count) meeting occurrences." Write-Output "There are no meetings in the specified timeframe." Edit 3/27/17: Rather than add another post, this entry has been updated to reflect the addition of the Find Groups button added for group mirroring. When automating distribution lists, eventually someone will want one that doesn’t use its own filter, but contains the same members as another group. (Usually it is a security group when there is separation between DLs and security groups.) The module has always supported group mirroring, but it required a specific syntax (the LDAP filter had to be prefixed with “guid:”) and that the object’s GUID be entered (without curly braces). 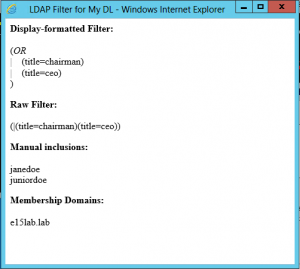 A group’s filter now separates using either an LDAP filter or group mirroring. 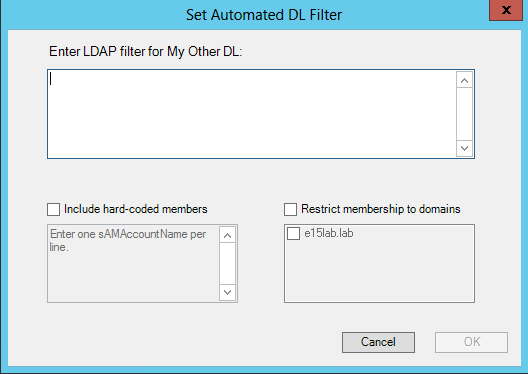 You select the radio button for either using an LDAP filter or mirroring the membership of other groups. You no longer manually enter the GUID of the object, but enter the distinguished name of the object and it will be converted to the objectGUID when saving the filter. (Using the objectGUID allows membership updates to continue even if the source group is moved and its distinguished name changes.) You can also add groups to the list by clicking the Find Groups button and searching for them. This functionality is provided by an external library that is included in the download. Put the DLL in the same directory as the module and it will automatically be loaded. I have added a check for the library, so if it isn’t found, the Find Groups button will simply be disabled and a label will be displayed next to it that says the dependent file could not be loaded. When running Get-AutoDLFilter and Set-AutoDLFilter, the objectGUIDs will be converted into the current DNs for display. 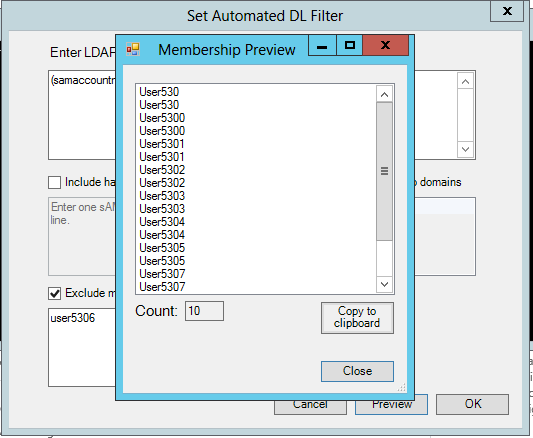 The GUI output of Get-AutoDLFilter has also been updated to reflect whether it is using an LDAP filter or group mirroring and, if the latter, doesn’t display the sections for the display-formatted and raw filters. The distinguished name of the object(s) will be validated when the focus leaves the text box (unless clicking the Cancel button), checking that it resolves to an existing group object. If updating a group’s filter from the command line, the MirrorGroup parameter has been added to the Set-AutoDLFilter cmdlet. The same DN validation occurs when updating from the command line, and the LDAPFilter and MirrorGroup parameters are in separate parameter sets so that they are mutually exclusive. Any existing groups using group mirroring are compatible with this version: Nothing has changed on the “back end,” only how the groups being mirrored get added to a filter has been updated. I have spent a fair amount of time updating the AutoDL module I first posted back in December. At the end of that post I mentioned several things I was considering adding, and that made me want to add some of them. The ability to exclude users from membership is now an option. The Set-AutoDLFilter cmdlet has also been updated with the AlwaysExclude parameter. 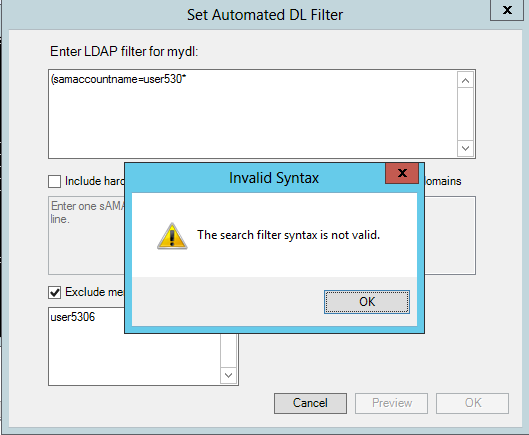 LDAP syntax will be validated and present a warning if it does not pass. Clicking the Preview button opens a new window to show who will be in the DL. The preview window will display a sorted list of member display names. You can copy this list to the clipboard to be able to, for example, paste pending membership into an email of the person requesting the DL for confirmation. There is also a field that provides the membership count. If the filter results in no members, the count field will contain a hyphen and the Copy button will be disabled. You can get detailed membership changes in the screen output and log file. The Verbose parameter can be used with Set-AutoDLFilter and Update-AutoDL to get more details of activity. I added a bunch of Write-Verbose commands while I was debugging these recent changes and I left them in for those that want more information about what is happening. The module has been updated to conform with the recommendations of the PSScriptAnalyzer module. The module now requires PowerShell version 3 or higher and will check for that. Several (well, more than several) minor fixes as a result of previous changes made that weren’t discovered until I was testing in a new lab and had to create new DLs and provision them and do other tasks that are less common once you are only maintaining automated DLs. This is what modules like Pester are for, I suppose. Years ago I used a third-party application for creating, managing, and updating automated DLs in Exchange. When I moved to another company that didn’t have that application, nor would spend the money to buy it, I wrote a script as a poor-man’s version of that application. Since then, it has been updated with more features, and I recently updated it again for a customer who wanted features I had never needed. The module uses ADSI to manage the groups, search for members, and to update membership. A few of the Exchange cmdlets are used to validate that a group exists, and to enable it for automation. If you want the module to be implicitly loaded, or explicitly loaded without specifying a path, put the module inside a directory of the same name inside the Modules directory of your profile, e.g., C:\Users\<username>\Documents\Windows PowerShell\Modules\AutoDLManagement\AutoDLManagement.psm1. You can put it anywhere if you want to load it manually and specify the full path to it. Whether using implicit remoting or a shell loading the Exchange snap-in locally, you’ll want to have the Exchange cmdlets loaded in the session before running any of the AutoDL cmdlets. Note: There is no syntax checking for the filter, so be sure you enter a valid one. There is no external dependency except for the module to update the group membership. The default configuration is to include all matching recipients in the forest, but you can specify one or more domains in the forest that membership is restricted to. This is a filter that is applied in addition to a group’s filter, such as not including terminated users. If the module is unable to add members after clearing membership, resulting in no members, you are notified so you don’t end up with a group that people are emailing and no one gets the message. Note: Exchange Online support requires groups to be authoritative on-premises, syncing to Exchange Online via AAD Connect. 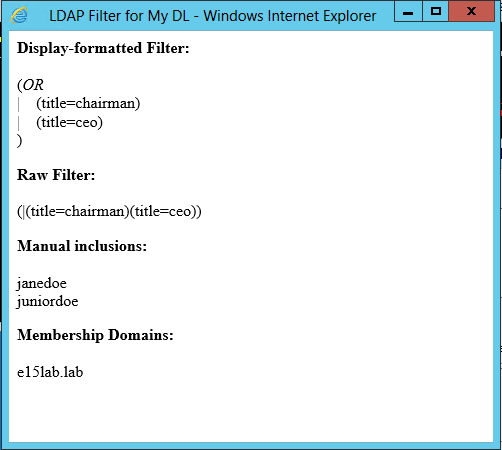 When you run Get-AutoDLFilter, the result is an IE window that displays the LDAP filter, the static members, and domains for membership. The filter is displayed as both a raw string that you can copy and paste for editing, and as a formatted filter (based on my LDAP-formatting script described here) that can be easier to read and is useful when sending a filter to a user. Sometimes a group owner wants the membership to mirror a security group because it isn’t mail-enabled. 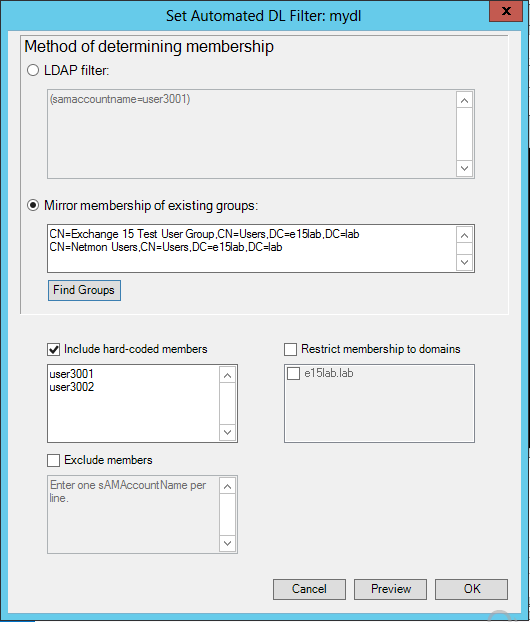 You can mirror membership of one or more groups by setting the LDAP filter to be “guid:<GUID of group>”. Separate multiple GUIDs with a semicolon. The form performs basic checks in order to enable the OK button: if static members is checked, then the text box has to be populated; if domain restrictions is checked, then at least one domain must be checked.When you run the cmdlet with a group that already has membership criteria, the form will be populated with the appropriate values, so you only have to modify what is to be changed about the criteria.For command-line updating, use the appropriate parameters for the filter, static members, and domain restrictions. (The parameters are documented in the cmdlet’s help.) If you update from the command-line, you need to include all values even if it isn’t changing. 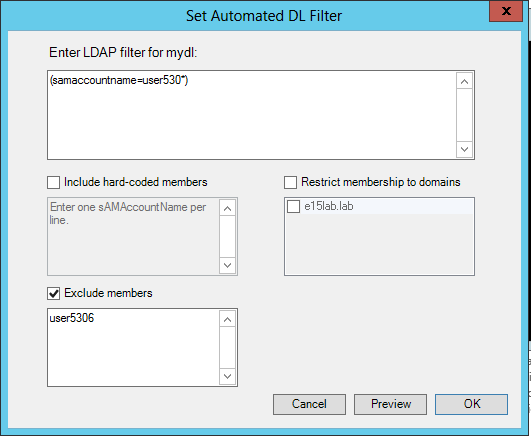 For example, if you are modifying the LDAP filter for a group that has static members, you need to specify those members even if they aren’t changing. Otherwise, the static members (or domain restrictions) will be lost. For bulk-enabling and -changing groups, you can pipe groups to the Set-AutoDLFilter cmdlet. This allows you to bulk-enable groups for automation and set their membership criteria if you already have that information in, say, a CSV. You can use a switch parameter with the cmdlet to suppress the confirmation prompt to enable automation for a group. Currently, you need to manually enter the source group’s GUID in the LDAP filter field (preceded by guid:). The object picker would let you browse the forest and select a group to have its GUID automatically entered. In the criteria editor, you could click a button to preview the membership based on the criteria currently specified (and without having to save it). Currently, group membership is cleared and then updated with all objects returned in the search. This has an element of risk because if a failure occurs between clearing and adding membership, the group is left with no members. This feature would compare the current and pending memberships and only add/remove the necessary objects.